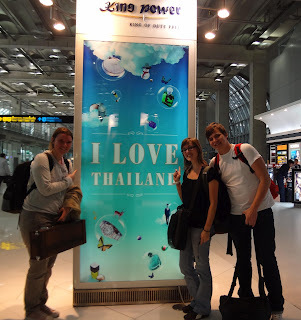 Sam's Thai Adventure: Bangkok at last! After waiting an hour or two, we got on a huge plane that would take us to Thailand. We thought we would have some extra room for our legs, but guess again, heavy spasms in our legs after only three hours of flying. All in all, time flew, before we knew it we were in Bangkok International Airport. When we reclaimed our luggage, we were welcomed by a delegation of seven very friendly people. When our luggage was loaded we got ready for a 7 hour long trip in the mini-van. The first thing we noticed was the abundance of flags in this country! National Thai Flags, Yellow flags to praise the King, Blue flags to praise the Queen,… And in the center divider of the road there were often large statues which represented Buddha. We stopped at a local fruit market and there we were immediately asked to taste a variety of exotic fruits like Guava, Pomegranate and Jujuberry (they were all very good by the way). When we were browsing the market, it suddenly started raining. The owners of the fruit stands quickly pulled out their plastic covers and there wasn’t much left to be seen. So we decided to drive on and about an hour later, we stopped for dinner. We had rice with fish, spicy salad (you’re going to read this very often), chicken and soup. After dinner we still had a four hour drive ahead of us, so we sped off. We all slept like rocks on the way to our guest family, but when I was awake (for a very brief moment, mind you) we almost crashed upon a buffalo crossing the road. After a total of 20 hours we arrived at our destination. P’Nee (father), P’Phet (mother) and Nongh’Pete (son) will be our hosts for the following month. They’re nice people but their level of English isn’t that high. We were shown to our room (it’s actually the son’s room) which holds a desk, a wardrobe and a double sized bed. Luckily there is a fan because it was still about 26°. We were given some water and went to sleep. It took a while to fall asleep because of the many strange noises we weren’t accustomed to. Vanuit het koude België volgen wij jullie op de voet. Alles gaat zijn gangetje hier. Wachten vol ongeduld op nog wat fotookes. Amuseert ulder en dikke kussen. Wij hopen dat jullie het ginder nog naar je zin hebben. We wensen jullie alvast veel plezier & werkgenot. Groetjes.